This course describes the various tax consequences that arise when the taxpayer receives or pays a lawsuit judgment, award, or settlement. Both gross income inclusion rules and tax deduction issues are discussed and illustrated with examples from case law and IRS rulings. 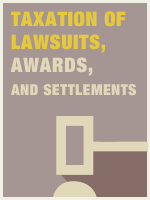 The payment of attorney's fees is also covered extensively. After taking this course you should be able to accurately assess the tax ramifications of damages and settlements received or paid by your clients and assist your client and counsel representing your client in structuring lawsuits and settlement agreements.